A new, free, web resource is available for clinicians and families that will aid in the protection of children from exposures to health hazards in the environment. Access the peer-reviewed PEHT during well child visits to educate parents on everyday hazards related to air, water, food and products. You can feel confident in the concise information and guidance in the PEHT, as it was created and peer-reviewed by experts in the field nationwide. Parents are concerned about environmental health threats, yet most pediatric care providers do not offer prevention strategies during office visits. Why? Many pediatric care providers report they feel ill equipped to educate families about common environmental exposures. 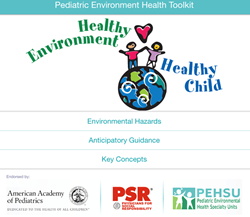 In an effort to fill the need for this information, the Pediatric Environmental Health Specialty Units (PEHSUs), and Physicians for Social Responsibility (PSR), have launched the Pediatric Environmental Health Toolkit (PEHT). The PEHT, endorsed by the American Academy of Pediatrics (AAP), is based on material in the AAP ‘Green Book’. This free and up-to-date resource offers trusted information at your fingertips. Bookmark the toolkit website and discover simple ways to educate and guide parents about environmental health during well child visits. The PEHT provides examples of the everyday interactions of children with the environment and steps clinicians and parents can take to decrease harmful exposures. Beginning in the womb and continuing throughout life, multiple environmental factors are strong determinants of health, even decades later, making it ever more important to provide the most current and scientifically-based advice to patients on how to have healthy families. Research shows that parents are anxious to have this information. Now, the PEHT makes it easy for clinicians to provide. The Pediatric Environmental Health Specialty Units (PEHSU) program is co-managed by the American Academy of Pediatrics (AAP) and the American College of Medical Toxicology (ACMT), and funded by the federal Agency for Toxic Substances and Disease Registry. PEHSUs are a source of medical information and advice on environmental conditions that influence children’s health.